I’m probably going to get in trouble for only posting the picture of one princess. Maybe I’ll get more. There’s only so much one blogger can do in a day don’t you know. 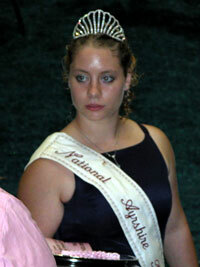 I was in the show ring during the Ayrshire awards and got to snap this photo of the Ayrshire princess. I don’t even know her name. If you do, please post a comment. Thanks. The picture is of Beth Evangelista, National Ayrshire Queen. My daughter, Greta Nelson 2005 Wisconsin Ayrshire Queen and Katelynn Gher, Wisconsin Ayrshire Princess were with her most of the day yesterday posing for pictures and giving out awards. Greta says Beth and Katelynn were so much fun and were so nice to work with! I think they make wonderful ambassadors for the breed!